Have you ever been out shopping (at the store and on-line) when you see something that instantly reminds you of someone you know? Well, that happened to me…although I instantly think of me when I see a lot of things, this gift wasn’t for me. It hasn’t been sent yet because 1) I have a lot of things going on at the same time, kind of like having a bunch of tabs open on your computer (LOL), and 2) I also have a horrible relationship with Mr. Proscrasination. However, I made this card to go with the gift. I’m not worried about her seeing it because she doesn’t follow my blog. HA! I know what you’re thinking! “What kind of friend is she?” That doesn’t matter because I know she’s my friend and that’s all there is to it for me to send her a gift of something that totally reminded me of her when I saw it? Was is it you ask? I can’t tell…..just in case someone she knows (that does follow my blog) tells her. I did make this card for two reasons…first, for her and second for this week’s Stamp Ink Paper Challenge #36. I’d lovefor you to join us this week! February On-Line Orders. Use Host Code ESWBJRU4 and a surprise FREE gift from me when you place an on-line order via my on-line store. Please do not select “No Contact” when placing your order, I will not receive your information and will NOT be able to send you a free gift. 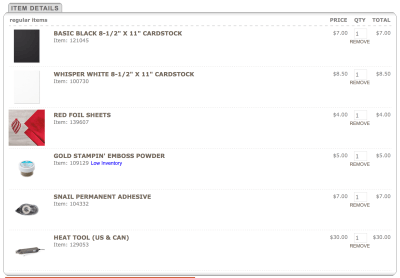 I WELCOME HOBBY STAMPERS! Purchase the kit and join Stampin’ Up! thru me, but read more about it here and become part of the virtual community of fellow stampers with access to exclusive resources, private stamping chats and endless ideas! There’s no obligation to sell and no penalty to drop and it’s RISK FREE! Hello Maggie: I wanted to come here and personally thank you for picking my card with the sweet little boy playing video games as one of the winner cards for the SIP challenge #35, the sketch was just perfect to frame this really endearing image. Now, this card you made is beautiful, very classy and elegant, gold embossing always adds a fabulous detail to your cards and framing this golden sentiment in the red foil paper, just took this card over the top.